Pneumadyne’s inline Flow Control Valves feature finely threaded stems that allow for gradual adjustment of the controlled flow passing through the valve. The pneumatic system’s air flow enters via the input port, travels through an orifice sized by the tapered stem, and out via the output port. Our pneumatic flow control valves include a bypass check which allows rapid free flow from the output through the input port. 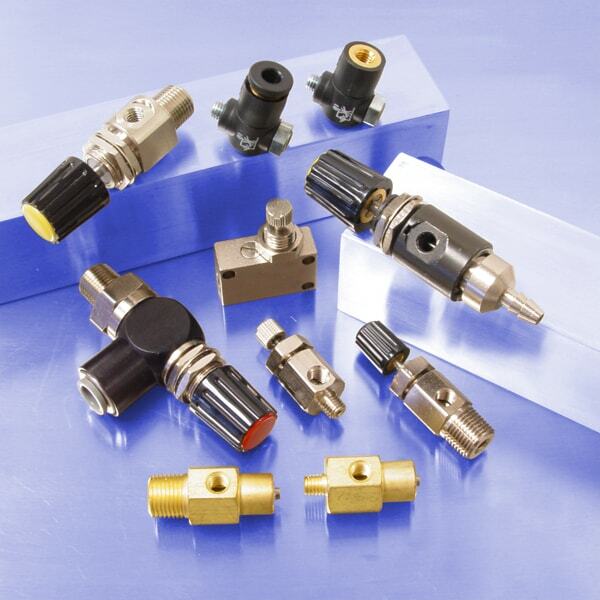 We offer two types of air flow control valves. Their selection and placement within a pneumatic circuit will greatly affect the function of an actuator. A meter-in flow control valve (also known as a reverse flow control valve) restricts the flow to an actuator. A meter-out flow control valve regulates the exhaust flow from an actuator. These are the most commonly used air flow control valves. Request a quote on the Pneumadyne Flow Control Valve you need, or contact us to learn more. Request a quote on air Flow Control Valves or other components for your pneumatic system, or contact Pneumadyne to learn more.